Air 1st Aviation Companies, Inc, based at the Aiken Municipal Airport (KAIK) has over 35 years of experience in worldwide aircraft sales, specializing in the Mitsubishi MU-2 Turboprop. As an aircraft dealer, we own our entire inventory—located at our facility in Aiken, SC—and we personally inspect, fly, and squawk each sales plane. In addition to aircraft sales, Air 1st operates the largest MU-2 fleet in the world, and we personally manage the maintenance on all of our aircraft. This intimate knowledge of the MU-2 places us in a unique position to understand your specific needs and requirements when it comes to owning and operating an MU-2. As the industry leader in MU-2 Sales and Operations, we also offer complete product support with our authorized Mitsubishi Major MU-2 Service Center at Carolina Turbine Support (CTS), also located on the field at KAIK. CTS offers expanded maintenance, avionics, and interior capabilities to MU-2 owners, in addition to handling most MU-2 part and accessory requirements. Our goal is to place you in an MU-2 that is suitable for your needs and budget and to provide you with complete after-the-sale support so you can fully enjoy and take advantage of the performance, reliability, safety, and speed for which the MU-2 is world renowned. 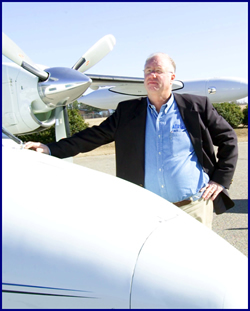 Mike Laver, a native of Australia, is the owner and president of Air 1st Aviation Companies, Inc. He has over 25 years of experience in aircraft sales and in the operational management of contracted flight services for the government and private sector in the United States and throughout Australia. In addition to handling aircraft purchases and sales for Air 1st, Mike has been overseeing contracted training flight services for the United States Air Force at Tyndall Air Force Base in Panama City, FL since 1998, operating and maintaining a fleet of nine Mitsubishi aircraft, flying 4200 flight hours per year. Prior to working for Air 1st, Mike owned and operated Great Western Aviation out of Perth, Australia where he operated eight aircraft (five being MU-2s) providing contracted flight services to major oil companies, flying over 6000 hours per year throughout the continent. As the holder of an Australian ATP and US Commercial/Instrument/Multi-Engine FAA license, Mike has been flying for over forty years with over 11,000 hours logged in a variety of single and multi-engine aircraft including more than 6000 hours in turboprop aircraft with over 5000 hours in the Mitsubishi MU-2. Mike also owns Carolina Turbine Support, Inc., an MU-2 parts and maintenance facility and Aiken Aviation Enterprises, Inc., the fixed base operator at the Aiken Municipal Airport. Click the link, “Tips on Buying an MU-2” to learn more about purchasing your ideal MU-2. Click the link MU-2 Service Center to learn more about Carolina Turbine Support.